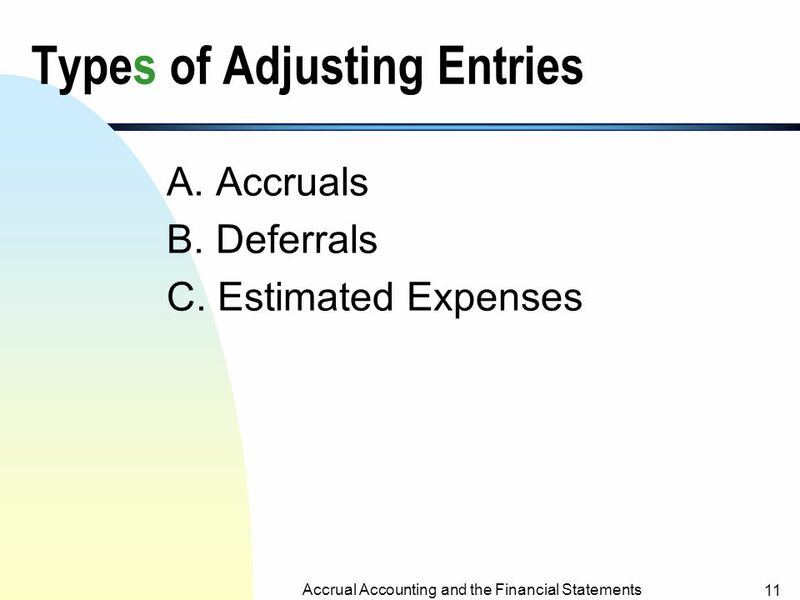 ACCT 100 Chapter 3 Adjusting the Accounts Accrual Accounting and the Financial Statements 2 Objectives of the Chapter I.Introduce the accrual accounting. 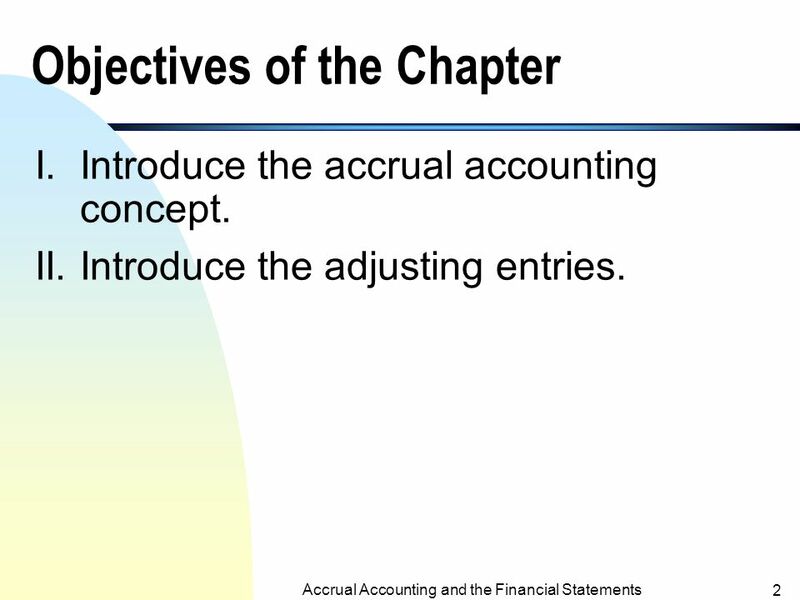 3 Accrual Accounting and the Financial Statements 2 Objectives of the Chapter I.Introduce the accrual accounting concept. II.Introduce the adjusting entries. 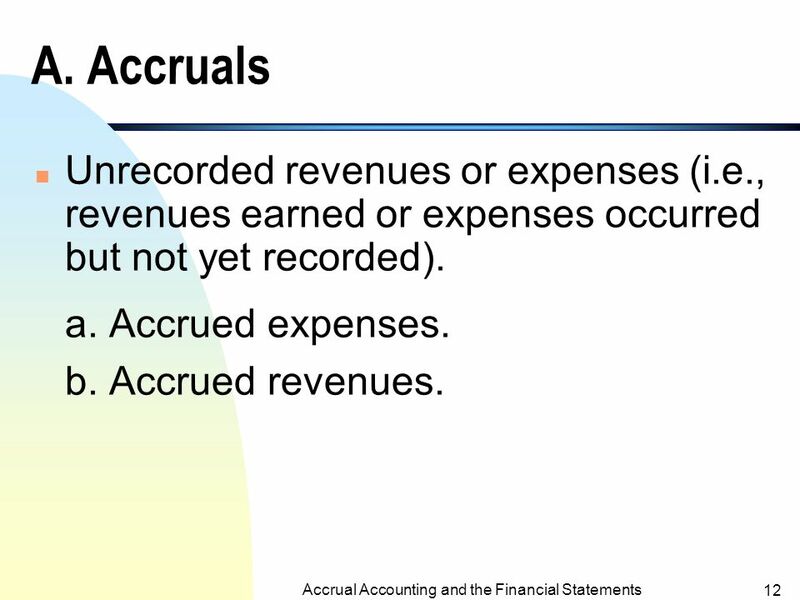 4 Accrual Accounting and the Financial Statements 3 I. 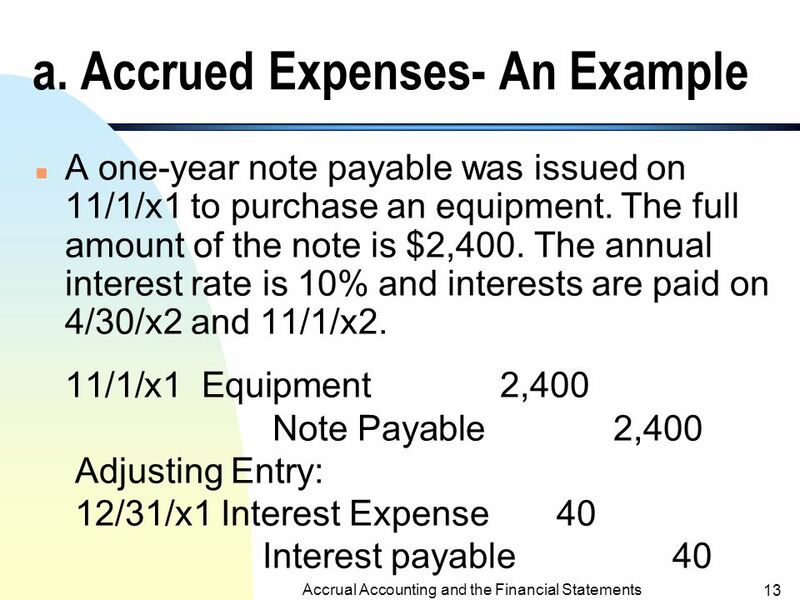 Accrual Accounting 1. The time-period concept, the revenue recognition and the matching principles. 2. 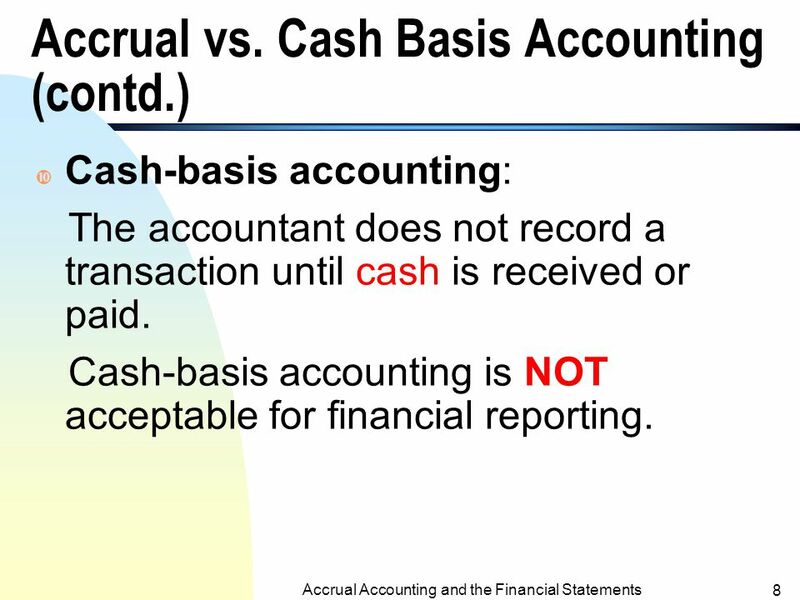 Accrual versus cash basis accounting. 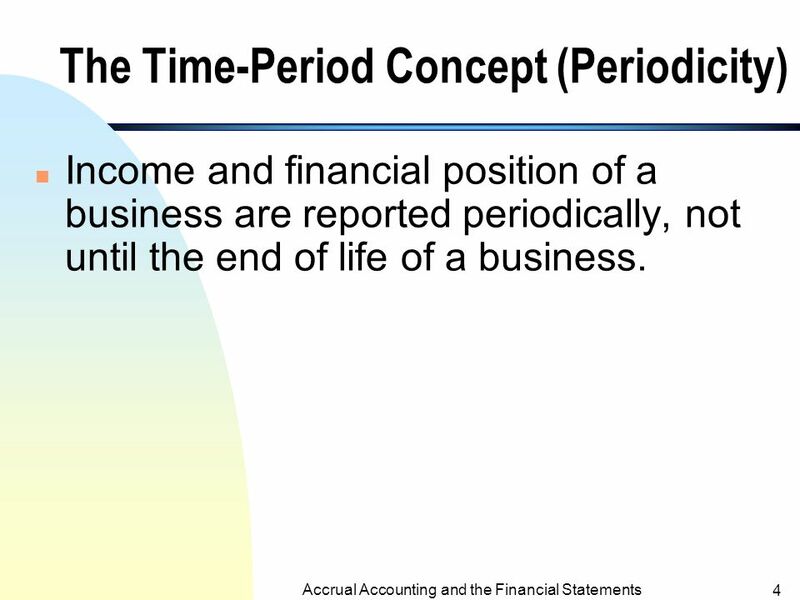 5 Accrual Accounting and the Financial Statements 4 The Time-Period Concept (Periodicity) n Income and financial position of a business are reported periodically, not until the end of life of a business. 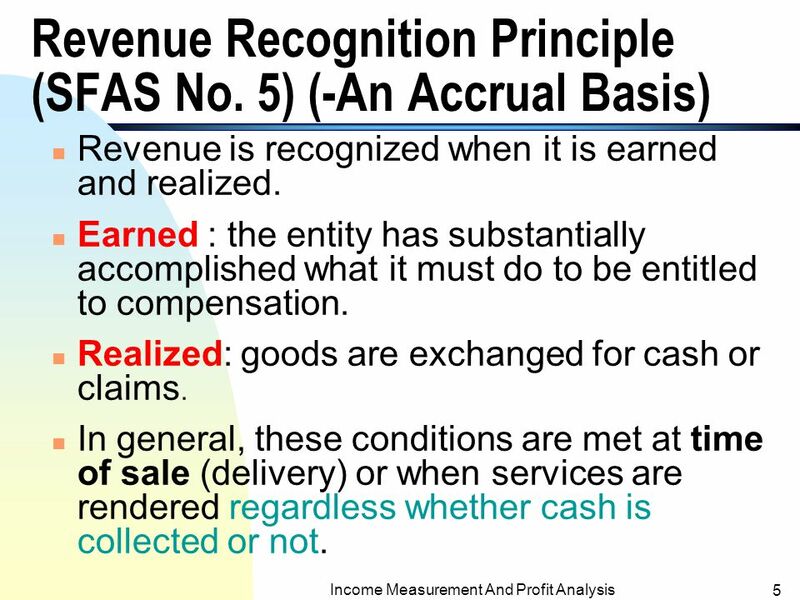 6 Income Measurement And Profit Analysis 5 Revenue Recognition Principle (SFAS No. 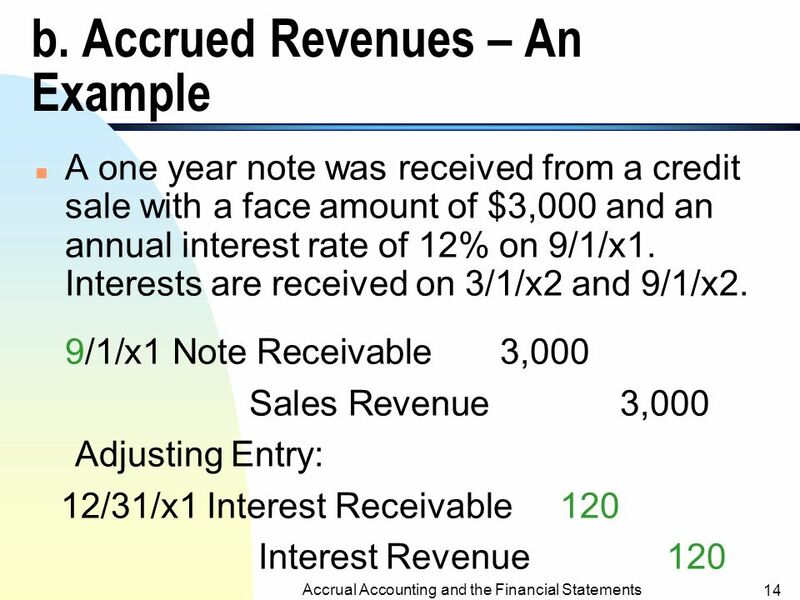 5) (-An Accrual Basis) n Revenue is recognized when it is earned and realized. n Earned : the entity has substantially accomplished what it must do to be entitled to compensation. n Realized: goods are exchanged for cash or claims. n In general, these conditions are met at time of sale (delivery) or when services are rendered regardless whether cash is collected or not. 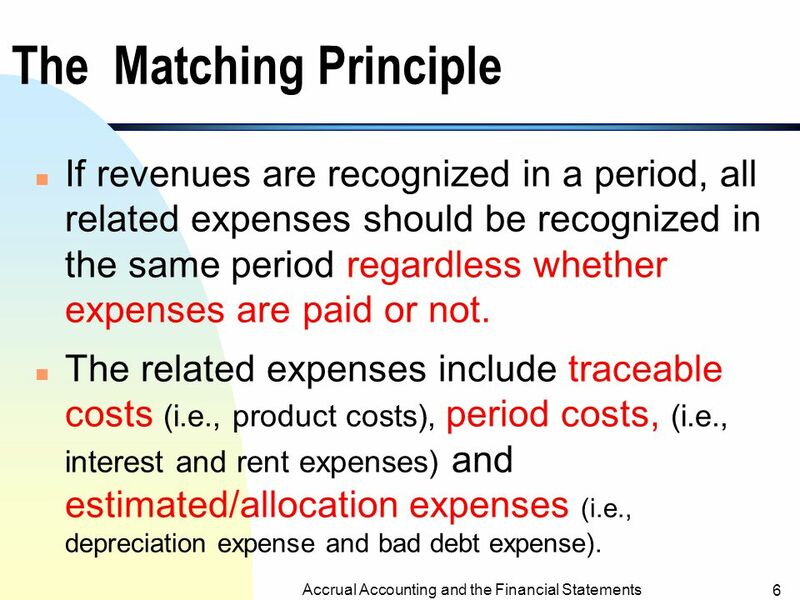 7 Accrual Accounting and the Financial Statements 6 The Matching Principle n If revenues are recognized in a period, all related expenses should be recognized in the same period regardless whether expenses are paid or not. n The related expenses include traceable costs (i.e., product costs), period costs, (i.e., interest and rent expenses) and estimated/allocation expenses (i.e., depreciation expense and bad debt expense). 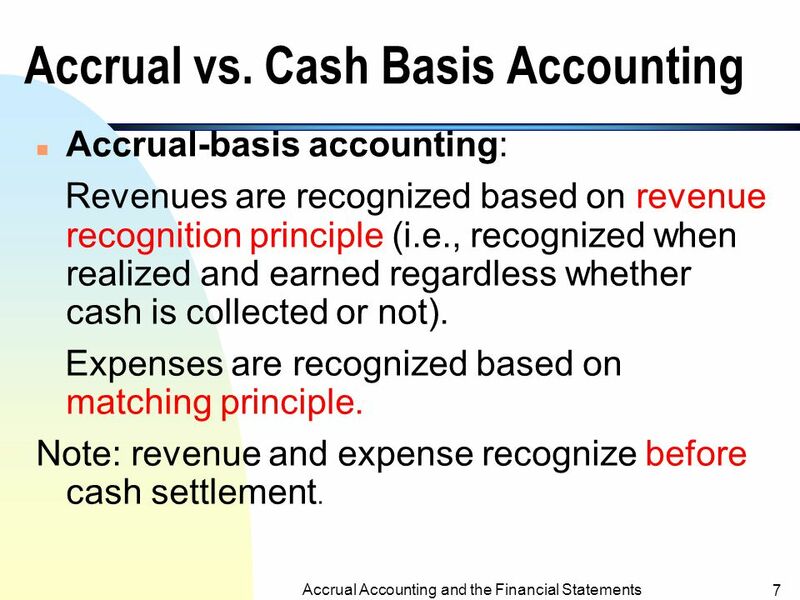 8 Accrual Accounting and the Financial Statements 7 Accrual vs. Cash Basis Accounting n Accrual-basis accounting: Revenues are recognized based on revenue recognition principle (i.e., recognized when realized and earned regardless whether cash is collected or not). 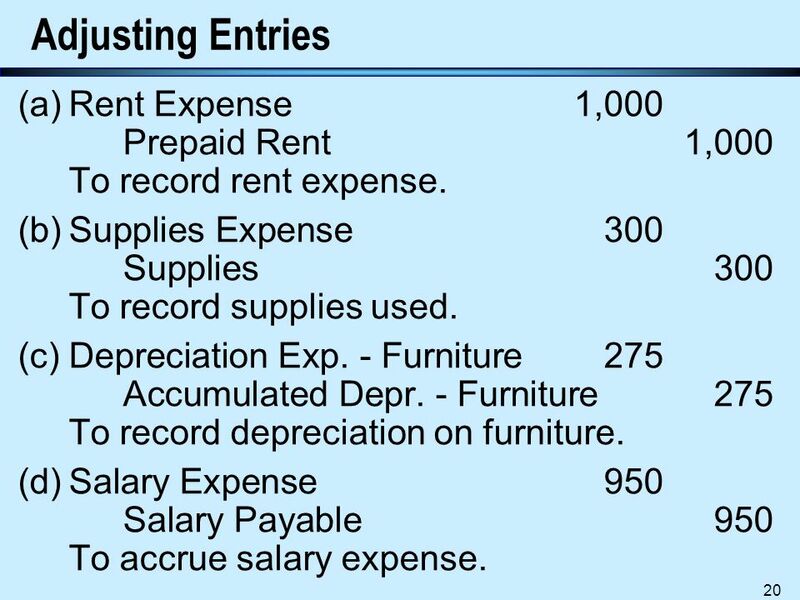 Expenses are recognized based on matching principle. Note: revenue and expense recognize before cash settlement. 10 9 II. Adjusting Entries n Due to the periodicity concept, financial reports are prepared periodically. 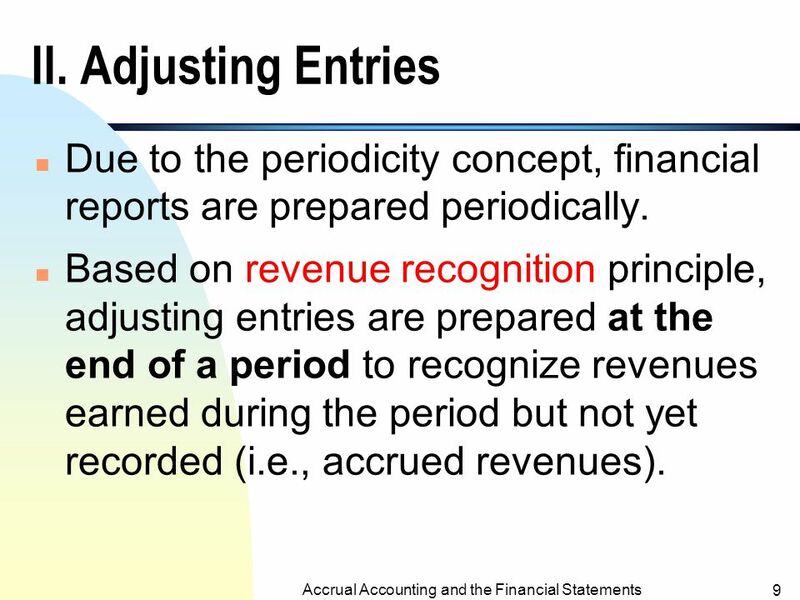 n Based on revenue recognition principle, adjusting entries are prepared at the end of a period to recognize revenues earned during the period but not yet recorded (i.e., accrued revenues). 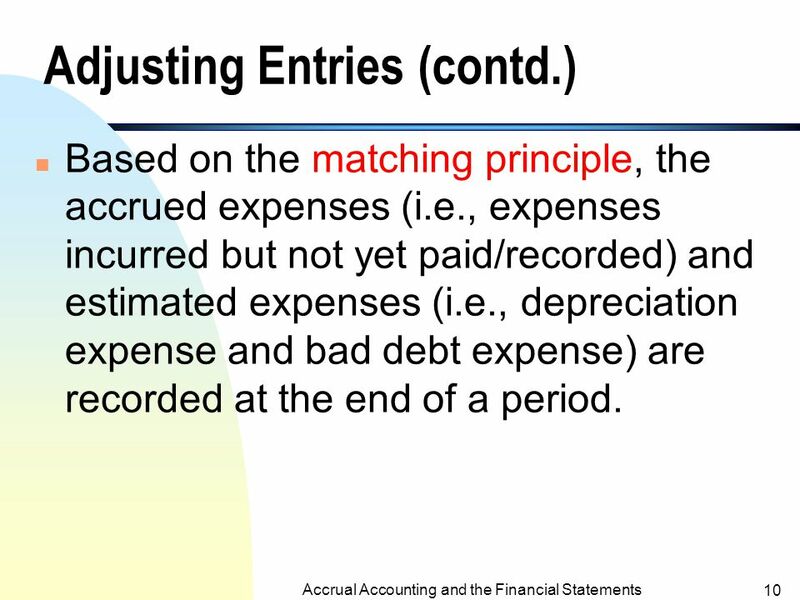 11 Accrual Accounting and the Financial Statements 10 Adjusting Entries (contd.) 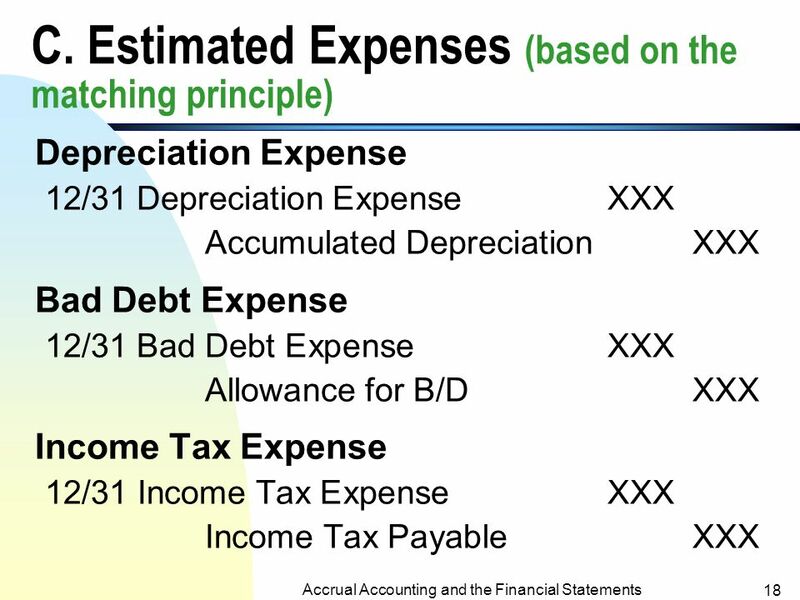 n Based on the matching principle, the accrued expenses (i.e., expenses incurred but not yet paid/recorded) and estimated expenses (i.e., depreciation expense and bad debt expense) are recorded at the end of a period. 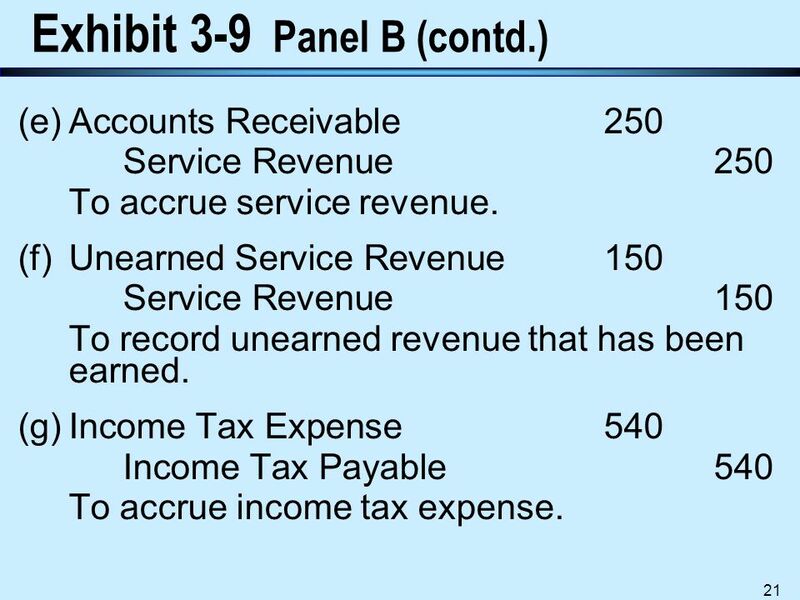 13 Accrual Accounting and the Financial Statements 12 A. Accruals n Unrecorded revenues or expenses (i.e., revenues earned or expenses occurred but not yet recorded). a. Accrued expenses. b. 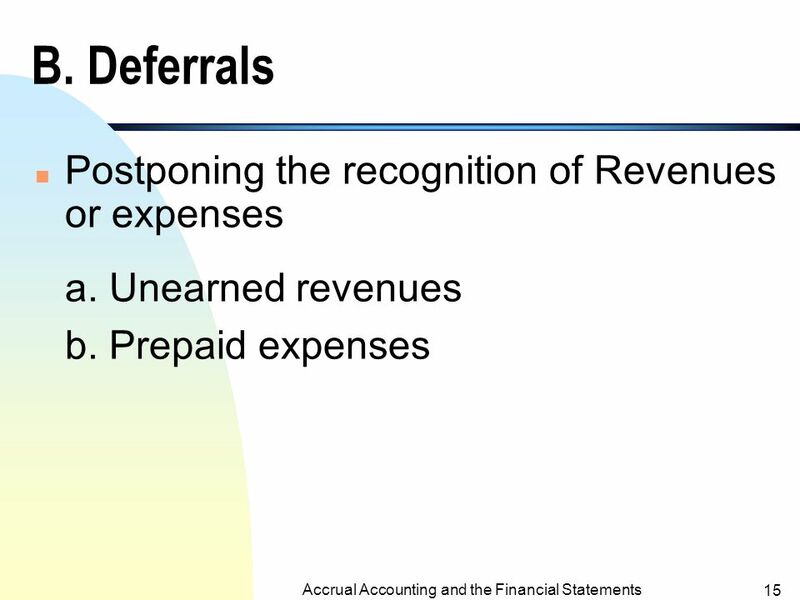 Accrued revenues. 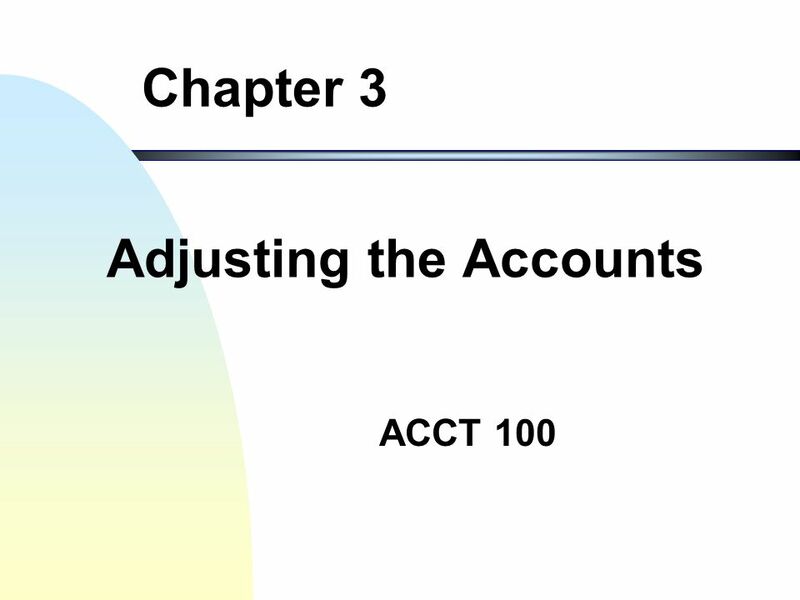 Download ppt "ACCT 100 Chapter 3 Adjusting the Accounts Accrual Accounting and the Financial Statements 2 Objectives of the Chapter I.Introduce the accrual accounting." © Prentice-Hall of India Private Limited, All rights reserved.1 Financial Accounting: A Managerial Perspective Second Edition Prepared by R. Narayanaswamy. 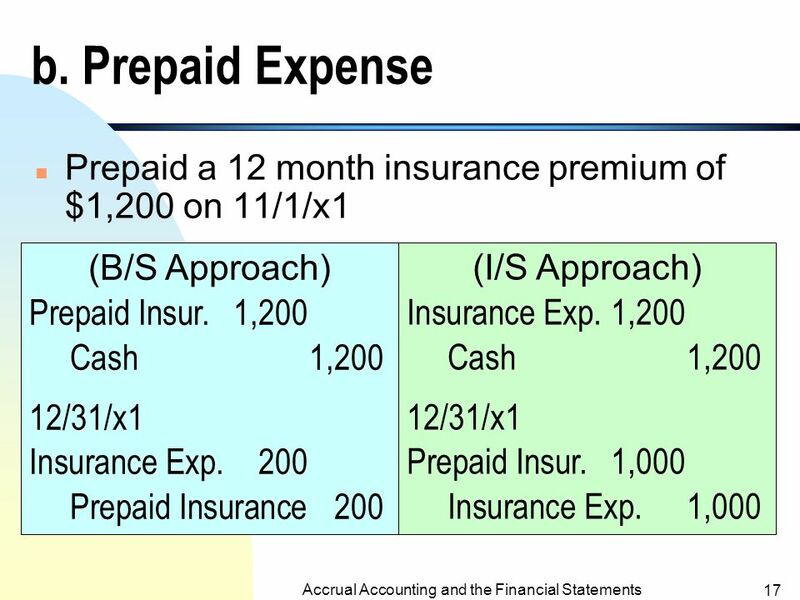 Review of the Accounting Process INTERMEDIATE ACCOUNTING I CHAPTER 2 This presentation is under development. Chapter 3 The Adjusting Process. © PHI Learning, All rights reserved.1 Financial Accounting: A Managerial Perspective Third Edition Prepared by R. Narayanaswamy Indian Institute. The Adjusting Process ACG 2021 Chapter 3. Copyright © Cengage Learning. All rights reserved. Chapter 3 Measuring Business Income. Chapter 4 Adjustments, Financial Statements, and the Quality of Earnings 9/07/04. 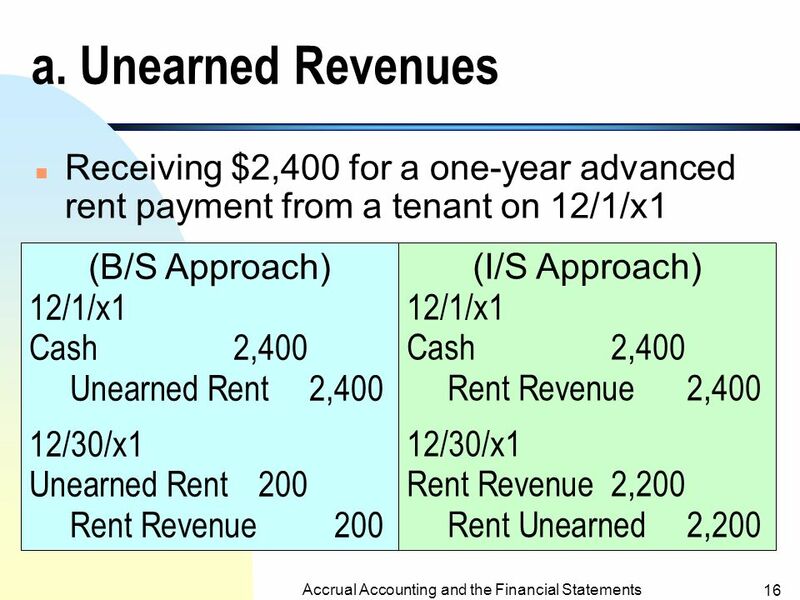 STUDY OBJECTIVES After studying this chapter, you should understand: Time period assumptionAdjusting entries for prepayments Accrual basis of accountingAdjusting. Chapter 3  Completing the Accounting Cycle. Chapter 3Mugan-Akman Accounting Cycle Analyze and record the transactions Post the transactions. 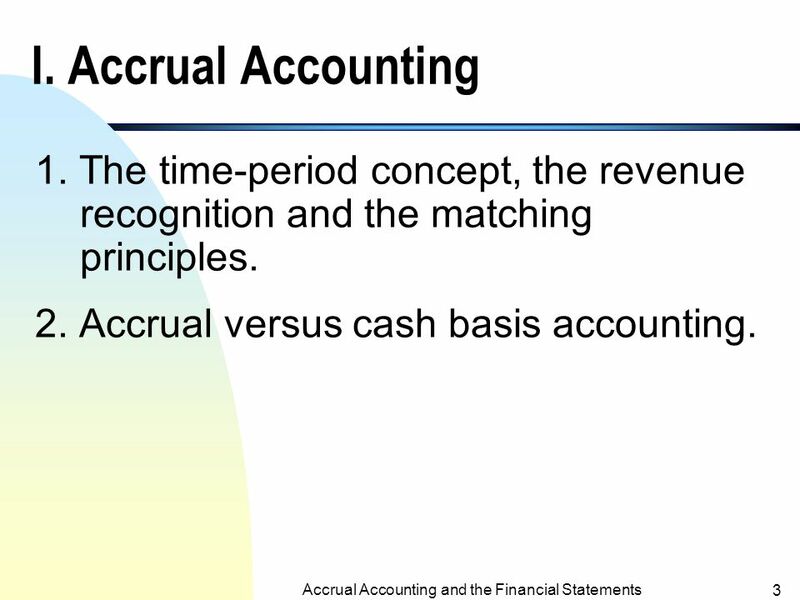 Accrual Accounting. Accounting that records the impact of a business event as it occurs regardless of whether the transaction affected cash. Adjusting Entries. Measuring Business Income n Accounting period assumption n Cash accounting versus accrual accounting n Matching principle n Materiality. 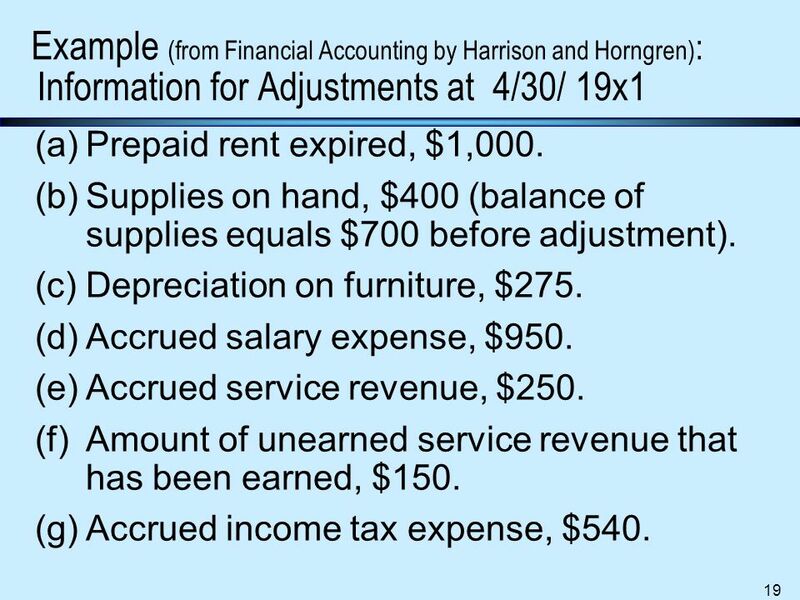 Adjustments to the Accounts Most transactions are recorded when they occur. Some transactions might not even seem like transactions and are recognized. Chapter 3  Completing the Accounting Cycle. Chapter 3Mugan-Akman Accounting Cycle Analyze and record the transactions Post the transactions and. Adjusting Entries Adjusting Entries bring certain account balances up to date at the end of the accounting period. Adjusting Entries are made after preparing.